Enroll in our scientific and comprehensive Vinyasa Krama Yoga School that inspired many students all over the world. Learn the science behind creating sequences following safe and intelligent sequencing parameters. 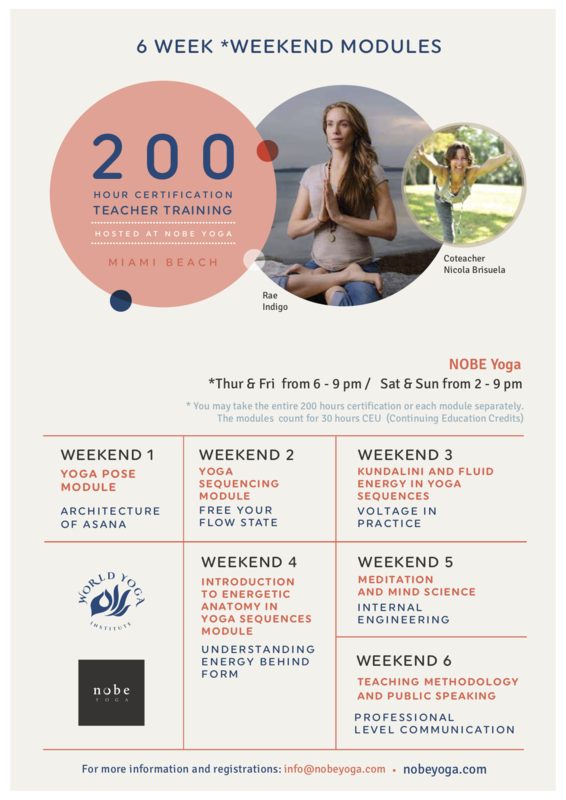 Nobe Yoga offers a comprehensive 200 hour yoga teacher training certification to all levels of yoga practitioners including yoga teachers and aspiring teachers. Rae Indigo, the CEO and founder of United Yoga, inspires students and will share her lineage of Therapeutic Yoga and Healing with Yoga in all her programs. Or just looking for personal growth and development? Immerse yourself deeper in the study of yoga! * You may take each module separately and each weekend completed counts for 30 hours CEU (Continuing Education Credits). Use the below links to get more information about our upcoming yoga teacher training schedule including dates, training modules and pricing. In this weekend module, we will study how to build yoga poses with respect to therapeutic alignment, flow of energy, the 8 directions of mobility, and the goal of yoga. These instructions are rooted in an ancient scientific system. This system creates lightness and awareness to the entire physical form, and beyond. It is an experiential approach to alignment which originates in the subtle energy body. This gives the student an ability to break down all asanas into the basic components and resynthesize the forms needed for a given situation. How free would you feel as a yoga teacher understanding the science behind creating yoga sequences? In this course you will learn to design sequences for many different kinds of practice; static, active, yin, restorative, hip opening, strengthening, inversions and more. You will understand the core elements of all yoga styles. You will learn to create practices for practitioners with limited strength of flexibility, so you can guide them towards a successful, ease filled and stable yoga experience. There is so much vast potential for ingenuity, and other doors we can open in the physical, energetic and mental systems when we step out of the box. Design like a Master Yogi. When exploring the inner dimensions of Yoga, we need to have an awareness of the infrastructure we are working with. Just like conventional medicine has it’s anatomy so the science of Yoga has its own subtle, anatomical networking. It’s from this space of energetic understanding we can see how to maximize efficiency within our physical and subtle bodies so that the goal and means of Yoga are established. In this module we will do an introduction to energetic anatomy, and learn how it applies to yoga sequencing. consciousness from the subtle to the gross. The yogi attunes himself to the higher-frequencies through exploration of an interior journey refining his awareness of self-identification. By turning attention inwards, with one-pointed focus, the yogi consciously tunes and controls all the cooperative powers and modes to become a divine instrument for the full flow of life-force to channel through. What is awareness of our own intellect? Learning how to swiftly access higher wisdom, recognizing and integrating the sense channels and clearing the way to act intuitively are all parts of the full yogic system, once we step beyond the physical form. You will learn using diagrams and clear explanations of the different levels of self how to bring these subtle levels, like the intelligence of our own higher wisdom and guiding intuition into our daily lives. Learn how to stand up and share your truth. Inspiring body language, vocal control, and facial expressions are just a few of subjects explored. Students will work on teaching and leading in a safe and comfortable environment. This is an optimal course for those who want to get past the barrier of nervousness, and realize their potential to share what has meaning, confidently. Enter your information below to sign up for the 200 Hour Yoga Certification.